ETA - links are working! 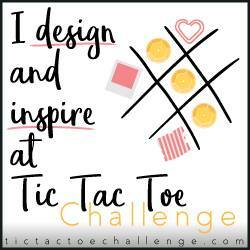 I'm daydreaming of Hawaii, our summer vacation destination, so I invite you to join me for this week's Tic Tac Toe Challenge, and enjoy my inspiration board! 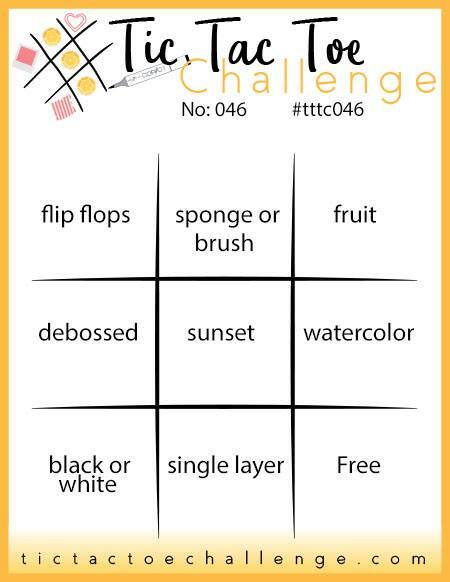 Summer, aloha, tropics, sea breezes, and "thinking of you" came to mind when I glanced again at this week's board. My inspiration came from the left diagonal (flip flops, sunset, and free), where dies were my "free" tool of choice. Doodlebug Designs has a new super happy collection called Sweet Summer that checked all my design boxes this week. The colors, patterns and sweet icon stickers called to me, so I layered up this beachy scene! The "thinking of you" sentiment stamp (Friendly Phrases) and Double-ended Flag Stacklets are from Taylored Expressions.